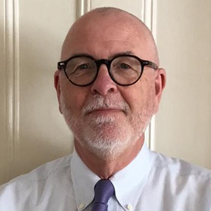 We are a New England based banking consulting group specializing in SOX/FDICIA/COSO, strategic planning, back-office efficiencies, core & ancillary system search, business continuity tabletop testing, organizational architecture, enterprise risk management, and IT risks. “We’ll be there - hope to see you!" 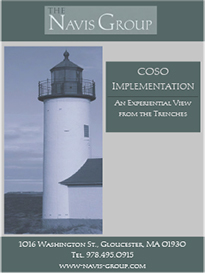 – An Experiential View from the Trenches. 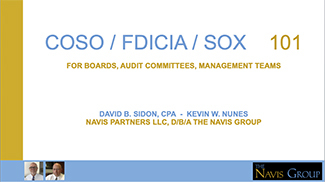 Please feel free to use this complimentary Powerpoint presentation for educating your Board, Audit Committee and/or Management Team on the nuances off FDICIA / SOX / COSO. 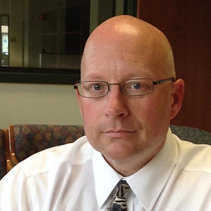 We’d be pleased to present this in person or via GoToMeeting and take questions - don’t hesitate to ask.
" 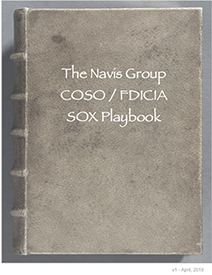 The Navis Group COSO / FDICIA / SOX Playbook"
We’re working on a manual detailing our approach, methodology and scope as we help institutions and companies tackle initial implementation or a “refresh” to update long-standing COSO efforts to best-practice standards. We are taking a “one-pager” approach to this, creating topical information that is contained within a single page. The manual will stand as an overview of the entire process, while the one-pagers allow ease of “answer” to team members, boards, directors, or examiners with respect to a particular question.